The International Green Purchasing Network(IGPN) Secretariat was launched in Beijing on November 26, 2018 at the “Capacity Building Project on Typical Green Products in APEC Economies－Workshop on Ecolabel and Green Consumption”. 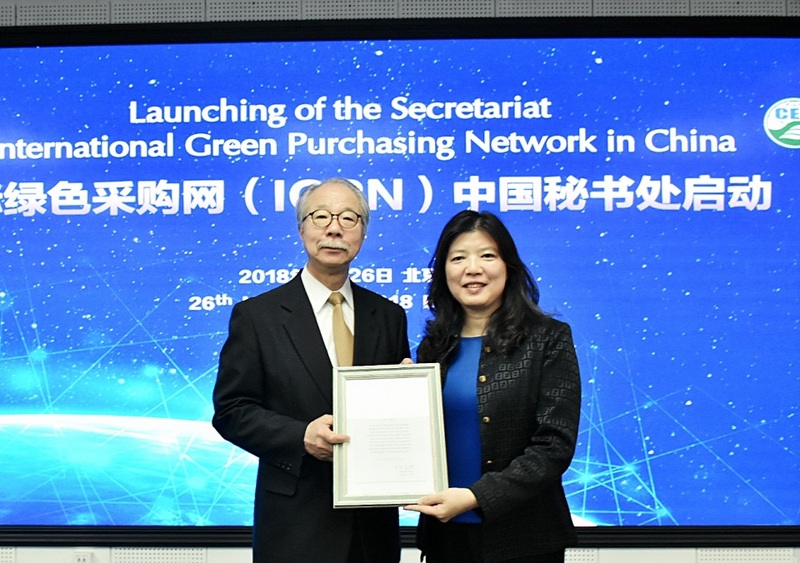 Witnessed by all the participants and international experts of the workshop, IGPN Chairman Mr. Hideki Nakahara officially handed over the Letter of Authorization to Ms. Zhang Xiaodan, General Manager of CEC. The handover of IGPN Secretariat to CEC obtains the approval of Ministry of Ecology and Environment as well as agreement of IGPN Council, Advisory Committee and all its members. The Secretariat will give full play to the role of IGPN; continuously facilitate green purchasing in public authorities and business sectors; actively promote green production and green consumption; promote green and win-win regional development and contribute to the achievement of UN Sustainable Development Goals.